Grant knew he was interested in using the Echo Meter Touch because of its great visual display. Since many bats echolocate at frequencies the human ear cannot hear, the Echo Meter Touch’s ability to “translate” the sounds into human hearing range with Real Time Expansion technology is an invaluable tool for active bat detecting. But for those with hearing impairments, it is the detailed visual display that is key to alerting the user to bat presence and echolocations. It can even be a way to train the user to identify or narrow down species by call shape appearance, as they happen in real time. 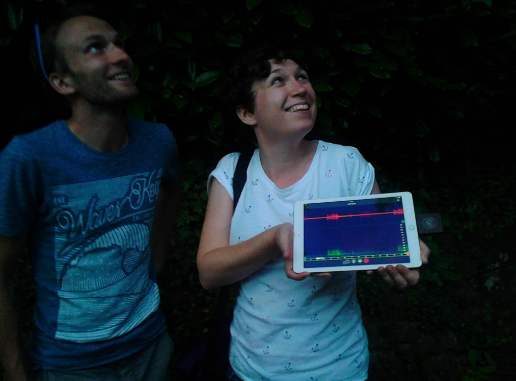 With a generous loan of the Echo Meter Touch by NHBS and the talent and enthusiasm of Alisdair Grant, the bat walk was a success. Grant led the participants using British sign language as he recorded and played back the bat calls on the screen to show them the bats that were all around them. He even froze the frames to compare different call shapes between species to see if anyone could spot the differences. Over the course of the walk, the participants witnessed Soprano Pipistrelles and Lesser Horseshoe Bats exiting their roosts in outbuildings in Cockington Court, and Common Pipistrelles, Serotine, and Noctule feeding in the Park and Lakes area.